If there is one food promotion that I keep waiting for (and hope to get invited AND be in town when that happens) is the Kitchens of India series at ITC Grand Chola. There is always an element of surprise, the food is generally brilliant and well researched and there is so much to learn from. It brings about, through food, both the similarities and the diversities in India. When the call came for an invite, I asked which kitchen they've gone and trained this time! Apparently there is something called Tulu Nadu. Nestled between the north part of Kerala and southwest part of Karnataka, Tulu Nadu as I have learnt over the past few days has a glorious history. The erstwhile South Canara as it was called earlier is even vying, if reports are to be believed, to be a separate state. With a dynastic past, the food is only expected to be brilliant. Knowing the amount of research ITC chefs put in for these Kitchens of India Festivals, I think I can trust them enough to recreate the food as accurately as possible! I have no prior knowledge or experience with the flavours or Tulu, so this is purely based on what we ate, which, I'll give you the spoiler, was excellent. 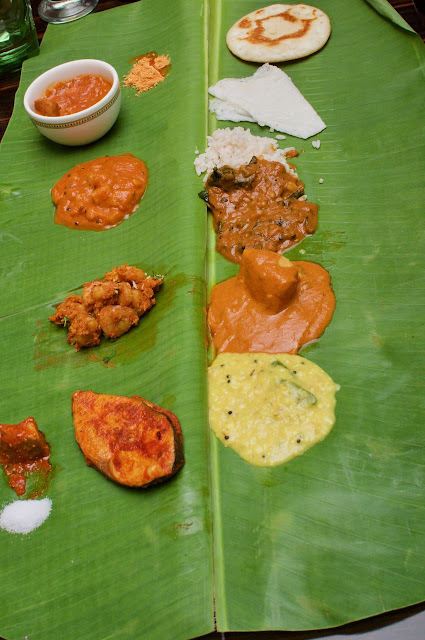 For a cuisine that is a sort of a fuse between Mangalorean, Coorgi and Kerala, it seems to have a lot of uniqueness. 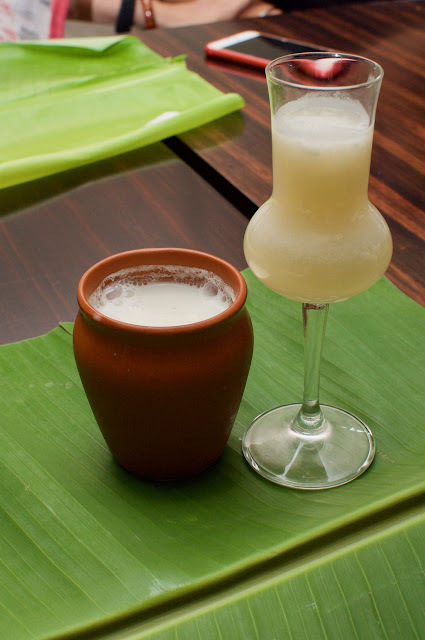 While the spiced chilled buttermilk and the Banana Bairada Juice, a nice concoction of coconut and ripe banana were a nice way to start the meal, the food was surprisingly distinct in its flavours. 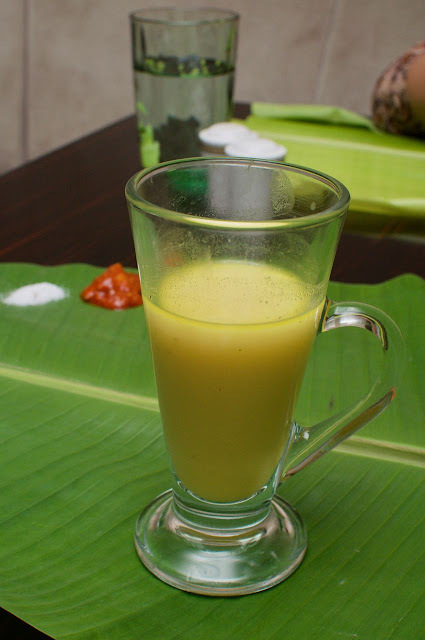 Meal started with another liquid, The Bele Saaru. A sort of rasam with cumin, the warm soup served in a glass kick started dinner. The first dish, though, set the tone for what to expect for the rest of dinner. Called the Natia Kori, the mildly spicy but richly flavoured chicken was rather distinct with the flavours of the two states blending to create a brand new flavour. The dish was hard to stop eating and the prospect of filling up the tummy and not having space to sample more awesome dishes was the only incentive to stop. The Errai da meen (though sounds like a French dish) that arrived next was supremely similar, but beautifully adapted for the fish. Similarly spiced like the chicken but mild enough to let the flavours of the fish take the front seat, this dish is a fish lover's dream. For someone for whom fish is not, well, the first choice of meat, I rather enjoyed it. Though the fishy flavours were clear, the mild chilly was just perfect to minimise the fish flavour from being overpowering. Instead of flavouring the fish, the marinade simply took of the nasty fish smell while retaining the best part of the fishy flavours. The main course, served for us in a banana leaf, had the best of magical flavours. The pineapple gojju, with its beautiful tartness playing perfect match for the rice could have easily been the dish of the day, but Yetti Sukka, a brilliant preparation of prawns with dry coconut and almost completely dry paired with the thin and light Neer Dosai was hard to beat. Or so I thought, before Kori Gassi - Kori Rotti arrived. A sort of rice roti was soaked in a Mangalorean chicken gravy. That is the dish I am craving as I write this piece as the soft bread that soaked up all the creaminess and flavours of the chicken gravy left me craving for more. I would have liked another roti to simply dip and eat, but I was told that the dish is as good only when soaked for longer. A beautiful fish gravy (again for a non fish lover, it was lovely) with a nice thick tomato-ish consistency paired well with rice. A rich Mamsam Biriyani completed the already rich meal. 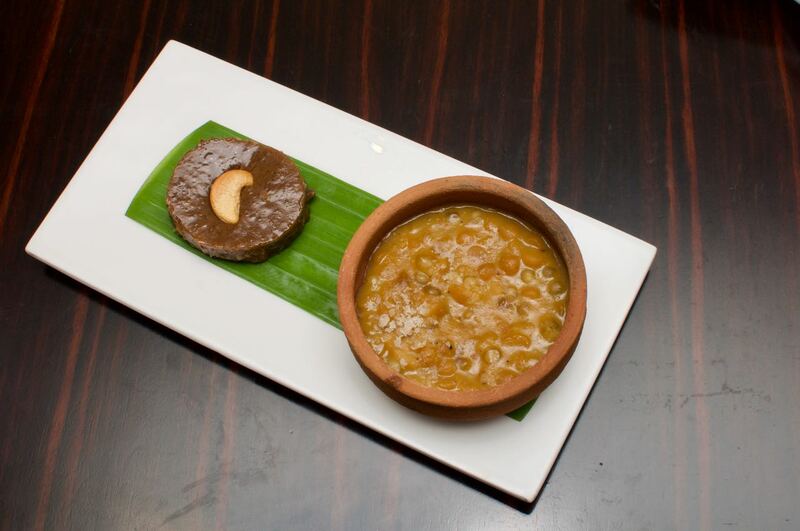 A payasam along with Ragi Manni, a rich ragi fudge cake completed the dessert course! Served as part of the Madras Pavilion buffet, the festival is on till the 25th of June! Service was quick, but we were a bunch of invited guests, so I can't really comment on service. I am now looking forward to the next Kitchens of India festival already. What will the theme be? Are we going to find exotic cuisines from North India? Will a new state emerge from it? Only time will tell!